Closed captioning allows you or another meeting attendee, assigned by the host, to add closed captioning in a meeting. In a webinar, closed captioning can be typed by the host, co-host, or a panelist assigned by the host. You can type the closed captions directly via Zoom or you can integrate a third party service. When adding captions with a 3rd party, Zoom offers an open API for integrating software and services. Read more about Closed Captioning with REST API. Learn how to view closed captions on desktop and mobile devices and in Zoom Rooms. Navigate to the Closed Caption option on the Meeting tab and verify that the setting is enabled. 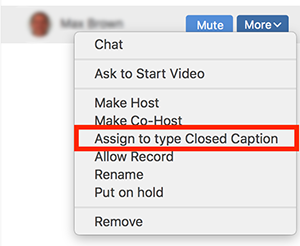 In a Zoom meeting or webinar that you are hosting, click Closed Caption. Select if you will type the Closed Captions, if you would like to assign someone to type or if you are using a Third Party provider. I will type: This will open up the closed captioning window. 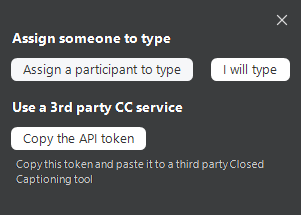 Assign a participant to type: This will open up the participants window. Hover over the participant's name and click on More. Choose Assign to Type Closed Caption. 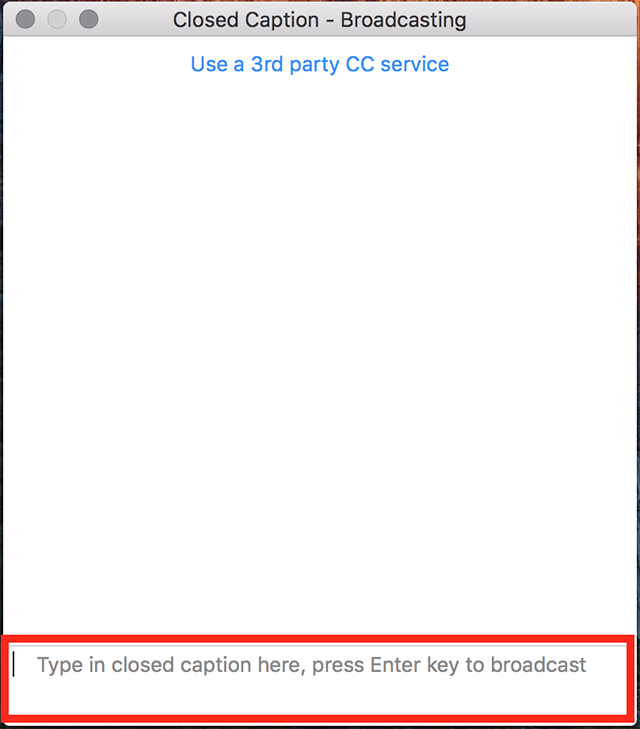 Use a 3rd Party CC service: This will give you a URL that you can provide to the 3rd party service to enter captions. If you are the host and you choose to type the Closed Captions, the Closed Caption box will open automatically. You will type the caption in the box and press Enter to submit it. Once the host assigns you the ability to type closed captions, a notification will appear in your meeting controls. This will open up the closed caption box. You will type the caption in the box and press Enter to submit it.